I believe that patient education and good communication between doctor and patient are the keys to delivering optimum health care. I take the time to listen to my patients and really understand their concerns. Dr. Dixit, listened to me, gave sound advice, did a test for H pylori, and prescribed a PPI. The only negative was that my symptoms got worse. Always good, knows my history and medications. Friendly personality. Nurse assistants are always friendly too. Dr was very up-beat. He asked a lot of questions. I like him.The only thing that bothers me is when I call to make a needed, quick visit is that MOST times I end up with doctors that I don't know. I don't feel that I am receiving the best care. many times I get the impression that these other doctors don't really care about me or my health issues. I came to the office with a list of concerns I had written, some serious and some not so serious. I really appreciated how Dr. Dixit took the time to listen to them all and address all my concerns. He did not make me feel like I was being silly or overthinking things and seemed genuine with his follow up questions. He had a patient smile as he listened and made me feel comfortable. He also let me know that there was no need for additional testing but he still took the time to examine me after we talked. He was really the best! Thank you Dr. Dixit! I felt that the doctor did not want to listen to my concerns and was rather short with me. I did not have a good experience talking with him and that he did not have the best decision for my care. so I am changing doctors before my next visit. I had a good experience overall. I wish the doctor would ask me more about my thoughts on my illlness. I hope the technical problems with the computers at the clerk's desk has been cleared as well. there are no appointments on the portal so I called in and was not able to get an appointment and then switched over to a nurse advisor who then left a message for the doctor on call. After being on the phone for 20 minutes I contacted Dr. Dixit through the portal and he called me back almost immediately. He asked me to just come in even without an appointment as he was concerned about my health issue. He is an incredible resource to Advocate and to his patience! It would be nice to have someone call you with all your test results, not just some of them. Some were e-mailed some were called. He was very helpful and called me at home with my x-ray results. I believe in Dr. Dixit. He is the primary physician for my wife and I. And we are both very pleased with him. Dr. Dixit was very thorough in examine my condition, and described in detail the lab work that was needed. I made him aware of my high blood pressure based on my dental visit, and after performing a blood pressure test, it confirmed my comments and a prescription with a followup visit proceeding was scheduled immediately. Provides sufficient time for my visit and answers my questions. Pleasant doctor to have. Very concerned! My doctor is always courteous, listens to my concerns and provides the best care. provider was very thorough in his examination, testing, and in the treatment he proscribed. It's always pleasant to see Dr. Dixit. I am very satisfied with my provider! He's been my PCP for some years now and I have no complaints regarding his bed side manners. He listens to me attentively and keeps me on all my annual check ups relating to my diabetes. Dr. Dixit is the best! Dr. Dixit and his staff are wonderful. They were all very kind and took the time to listen. I was shocked when I didn't have to wait more then 30 minutes for Dr. Dixit to see me. He was right on time and I very much appreciated that. I emailed a question about the antibiotic he prescribed and it was answered promptly. I also asked for some info to be faxed to my other doctor and it was taken care of. Office was clean and phone calls were returned in a timely manner. I was looking for someone who could help me with a vegan lifestyle. I'm not sure if Dr. Dixit is the right answer, but I think he will be supportive. The only problem is that he recommended I eat more dairy for a Vitamin D deficiency. I had already told him I was vegan. That was disappointing, but it was our first visit. He can't remember everything, right? Overall, really good experience. I hope I never have to look for another primary care doctor. Dr Dixit is the best I have ever associated with. I find DR. Dixit to be kind, courteous and concerned about my health. I feel like he never seems to be in a rush and always has time to answer my questions. Excellent experience with Dr. Dixit. Good service, great personal service. I wish they would have set up my annual lab work to be done prior to my appointment so we could have discussed the results in person not over the phone. Dr. Dixit as always, was concerned about my well being. He had a concern about the black and blue mark on my stomach after my hernia operation. And told me that I should ice it. Always gives me the time I need and encourages me how to positively handle my illness. I have felt fairly comfortable with Dr. Dixit since I started seeing him after Dr. X left out patient practice. he is very courteous and helpful. I thought I had strep throat, so I was nervous about going to work with a contagious condition, I called the office and they got me in in an hour's time with a different provider but he was as nice and professional as Dr X. I was seen quickly, treated the best they could and had all of my questions/concerns addressed. I would be happy to see this Dr again if needed. I do not like Dr. Satin Dixit at all, he is not a true good listener, he was to busy answering his phone. He forgot to write me my prescription for my refill. He did read my medical records well to know about my chest that I was suppose to have repeated this year, he gave me a order for the wrong breast ultrasound, so I have not went to get the ultrasound because my insurance will charge me for the wrong Cray on the wrong breast. I told him I need refill or new prescription for my cholesterol pills, whe I got home there was no order for a blood test for my cholesterol. I need to find me a new doctor quick because I need a new cholesterol refilled, I need a chest x-ray and a ultrasound on my right breast not both of them. I looking now for a new pcp. I've been seeing Doctor Dixit for over 10 years! If I had a gap between that I can't recall any other doctor that I saw consistently. I actually try to make sure that the insurance I buy has him as a provider. I'm happy with his care for me! Dr. Dixit is the best doctor I ever had. I am 74 and he is the best. I trust him. Dr. Dixit is a very caring and knowledgeable medical professional. I am very glad that he is now my and my wife's Primary Doctor. Dr. Dixit always explains things to me in simple language. He also tells me why I might need to do tests, he orders for me. He's a very knowledgeable doctor. we have been see this doctor since my child was 6 months, my child is now 5, my child is very comfortable with Dr. Dixit, (I am to) we alway have a good visit. I have been with Advocate for my Gyno for years and have been very happy. For my general care I've been with Northwestern for ten years. Last month I chose a HMO with Advocate only by Blue Cross Blue Shield instead of the PPO I had for years with Northwestern. I was nervous about making the change. But when I got sick in late December/early Jan I called Advocate down the street from me in Orland Park and I got right in!!! I had a terrible Sinus Infection and they gave me an appt the day after I called. The people at the clinic couldn't have been nicer and the doctor was so attentive. He gave me Penicillin as well as a serious cough medicine. I was very pleased with the care I received and it makes me feel confident about my new HMO with Advocate. Dr was polite but distracted. Extremely long wait times. Spend almost 3 hours waiting in doctor's office and then for blood draw. Takes a long time to get an appt. I didn't want to use the Scribe program or be recorded. I felt the Provider was rude to me when I declined. He wanted to know why not. After I told the nurse no he should have let it go and not press me about it. I am very impressed with Dr Dixit. He seems like a family friend that is totally committed to keeping me healthy. I'm so lucky to have found him as my primary care physician. Visit was very thorough, and all medical papers that were processed by Palos Community Hospital were brought in and reviewed by the provider. The staff took the paper work, and logged the necessary info into the system. Dr. Dixit was very pro-active in helping with my condition, which I really appreciate. And I did not feel rushed like I have felt with some doctors. dr. Dixit always takes the time with me to make me feel like we're not being rushed he answers all my questions and he performs an exam to make sure that all my vitals are what they should be and then we discuss the symptoms that I might be having ,he has a great bedside manner. Polite & he explained the provider was all that was needed. Dr. Dixit is a wonderful physician. DR DIXIT WAS VERY INTERESTED IN WHAT I WAS SAYING AND ASKED MANY QUESTIONS. THIS PLEASED ME. THANK YOU. Dr Dixit is never rushed always has time for any questions I may have. I always receive test results very fast. Dr. Dixit is always personable he has great bedside manner. Only started seeing Dr. Dixit this year, but very happy with his services and very confident he knows my health situations. Quite pleased with my overall experience with Dr. Dixit. He was wonderful and very attentive. Because my daughter is in college, I was with her and filled this out. I think Dr. Dixit is up on top of my list of doctors I've seen in my lifetime. He's warm, friendly, very knowledgeable and sincere. Dr. Dixit is one of the best doctor's I've had. I didn't feel like he cared about my health as much as he should have. At least he didn't show it. This was my first introductory visit with Dr. Dixit. My regular primary care physician is no longer working with Advocate but recommended Dr. Dixit as her replacement. She said he was kind, a good listener, and is CALM. She was right. He is all that, which is what I need. My mental state (GAD, panic disorders) requires priority attention along with my physical health. He came through, put me at ease, offered new suggestions, and followed up. I'm pleased to be in his care and highly recommend him to anyone with or without mental health issues. We love Dr. Dixit and wouldn't go to any other doctor - He is the best and we trust him. Dr. Dixit is very courteous and patient. He listens well and shows concern over health problems. He takes his time and is very thorough. The staff and the doctor were a professional, courteous, and informative. Dr. Dixit is a great provider and always asks if I have any side effects of the meds I am taking. He is very thorough and covers any and all health concerns I have during my visit. He always sends my prescriptions right away to the pharmacy, and he is very nice. Dr. Dixit makes the patient feel welcomed & valued. He is not judgemental but genuine in his attitude. He listens well & explained things clearly. He is the best PCP I have ever had. It was my first visit. I am new to Advocate Medical Group the system is very different from my previous healthcare provided; not bad, but different. Overall it has been good. 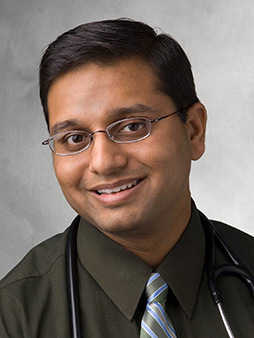 health eNews with Sachin Dixit, M.D.